Texas’ 2017 recruiting class wasn’t met with the same expectations and excitement normally associated with the Longhorns on national signing day. Tom Herman was just months into his new gig as head football coach and Texas failed to close with elite targets like K’Lavon Chaisson. The 2017 class ranked 25th in the nation. Herman corrected the glitch with his next two classes, finishing in the top three nationally and first in the Big 12 with the 2018 and 2019 cycles. The 2020 class is off to a fast start with five offensive commitments. Texas plans to compete for a Big 12 championship in 2019 and the 2017 class is becoming the backbone of the program. Here’s a look back at the hits and misses from the 2017 cycle. Ehlinger is the face of the program and a Heisman Trophy candidate entering his junior season. He was the No. 14-ranked player on the 2017 Fabulous 55 and the No. 4-ranked dual-threat quarterback in his class. He’s on his way to exceeding the high expectations placed upon him after his fantastic high school career. Ehlinger is the first true stalwart at quarterback for Texas since Colt McCoy. His bruising style of running and efficiency as a passer are perfect in Herman’s offensive system. The former No. 1-ranked inside linebacker in the JUCO ranks is now done with his eligibility. 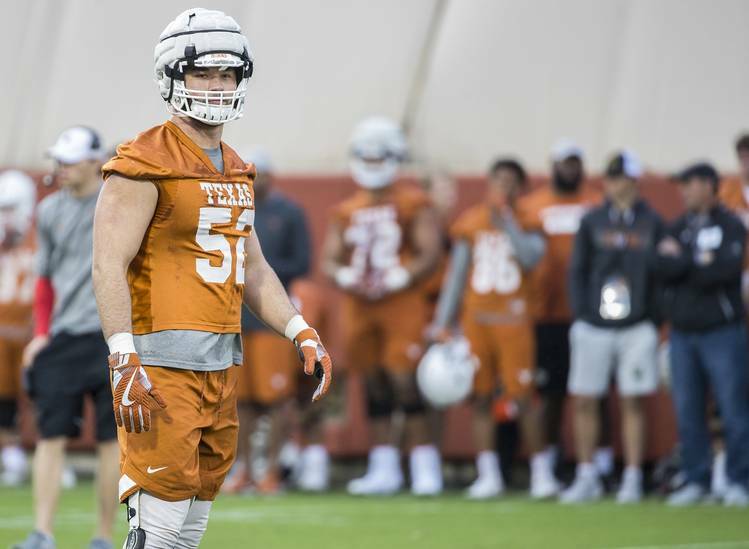 His presence still looms large, however; the Longhorns are still figuring out a replacement for Johnson at linebacker. He brought speed to the position and should find himself on an NFL roster this fall. He was a big get for Herman, as Johnson eased the loss of Malik Jefferson. Cosmi was a three-star recruit who followed Herman to Texas late in the cycle. He’s become the gem of the class after a successful redshirt freshman season starting at right tackle. He’ll be Texas’ left tackle for the foreseeable future if he continues the upward trajectory. He’s far exceeded expectations and could feasibly end up the top NFL prospect from Texas’ 2017 class. Graham is an expected starter entering his junior season. The big-bodied defensive end was the ideal fit for the odd-man front deployed by defensive coordinator Todd Orlando, who hopes Graham makes a similar impact as departed end Charles Omenihu. Graham started two of the 14 games he participated in as a sophomore and finished the season with two sacks. He’s poised for a breakout year. Brewer is a weapon at tight end when healthy and he’s growing into a true three-down tight end with the ability to stay on the field in rushing situations. He’s always been a matchup nightmare on safeties and linebackers. Expect a strong junior season from the local product with Andrew Beck out of eligibility. Bimage worked his way onto the field as a sophomore in 2018 before a season-ending injury against West Virginia. Expect a much bigger role from the versatile and insanely strong Bimage, who was another former Houston commit who followed Herman to Austin late in the 2018 cycle. He’s already proven his worth on special teams and is poised for more playing time as a junior with Texas losing all three of its starters on the defensive line. Bimage can also play B-Backer. Kerstetter started the final 10 games at right tackle as a freshman and is without question a solid contributor for Texas’ offense. He’s presented a chance to solidify himself as a true star in the class as a junior if he can secure a starting spot at either guard position. Kerstetter was an Army All-American who flipped his commitment from Oklahoma State once Herman arrived in Austin. The third year on campus is when most players flip the switch and Texas expects Thompson to be a difference maker in the secondary, whether he winds up at cornerback, safety or the nickel position. He’s a versatile player who played in 22 games in his first two years on campus. He started three games as a sophomore. Young was the unheralded running back in the 2017 class. He’s emerged as a solid depth player who excels in short-yardage situations. His durability should also be applauded, as the junior has played in all 17 games since arriving on campus. Young watched his role diminish as a sophomore. The former member of the 2017 Fabulous 55 has yet to truly make his mark on campus through two seasons. He redshirted in 2017. He played in 10 games on special teams last season, finishing the year with two recorded tackles. Estell was a highly recruited safety in 2017 but was passed up on the depth chart by freshman stars Caden Sterns and B.J. Foster. Boyce has followed a similar career path to Estell despite starting two games as a redshirt freshman in 2018. Boyce’s role could increase with Kris Boyd, Davante Davis and P.J. Locke no longer on campus. There is no shortage of young talent fighting for those snaps, however. Reese Leitao, tight end, Jenks, Okla.
Leitao was an intriguing prospect out of high school because of his size and background as a basketball player. He was redshirted as a true freshman and played in all 14 games as a redshirt freshman. The loss of Beck at tight end gives Leitao and Brewer a chance to make a real impact in 2019. Pouncey has yet to find a role outside of special teams. He took a redshirt in 2017 before playing in seven games as a redshirt freshman in 2018. He’s yet to record a catch. Cummins was a late addition to the 2017 class and has yet to record a snap as a Longhorn. He’s back at defensive line entering his sophomore season. 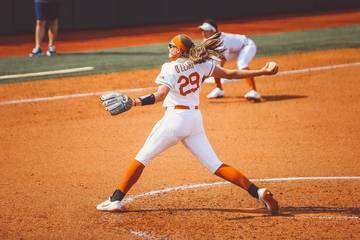 Chisholm gets one more year of eligibility at Texas after participating in four games in 2018. His role was larger in 2017 when he played in 10 games and recorded three tackles. The defensive line rotation was set in 2018 and that allowed Chisholm a chance to watch and improve for his final season on campus. Carter was a highly-touted running back who was committed to Georgia at one point before landing in Austin with Herman. His role evaporated as a sophomore with the emergence of freshman Keaontay Ingram and grad transfer Tre Watson. Carter transferred to Sam Houston State this winter. Rowland simply didn’t work out on the big stage at Texas. He struggled through his first season on campus before Cameron Dicker arrived in 2018 and overthrew Rowland at place kicker.